For my next installment of accessory addict (previous posts about belts, scarves, hats and shoes), I decided to focus on an often overlooked outfit component- our money holders. I adore evening clutches but have been guilty for using a boring everyday bag for months on end without thinking about it. I now make a conscious effort before I leave the house to ensure that my purse works with my entire ensemble for a fashionable finishing touch! 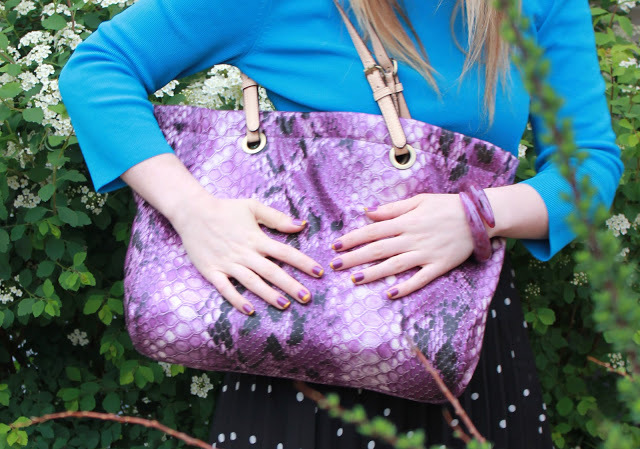 Are you passionate about purses? That thrifted cross-body "croc" bag and that vintage peacock bag will always have a home with me if you ever tire of them. I'm a huge clutch collector but I don't use them for everyday. I like to carry too much stuff in my bag for a clutch to be of any use on a daily basis, but they are the best for evenings and weekends! What a fabulous collection!! And the nails to match , I love it! You are speaking my language! I LOVE purses. I've really pared down on how many I have though sadly. I love the two you have with the tassels and also the leopard print one! That purple thrifted clutch - love it! And I am reallllly bad with bags too ... Really bad, let's just not go there. I don't know if I'm passionate but I definitely do care about my bags and purses. and usually I go for high quality bags because I wear them for long long years. but I also have some thrifted bags. my collection is not very huge but I guess 10-20 should be the right number. your collection, by the way, looks pretty amazing too! it's amazing how many wonderful thrifted beauties you have! Oh wow, that peacock purse is awesome! I love that peacock purse, absolutely adorable. Love the dress, and the bracelet as well!